I have talked about Rock N Learn before here on the blog and how much JJ loves the DVD's. We recently watched another great one called Colors, Shapes and Counting. My son loves all of the characters and sings along to the songs :) As always Rock N Learn has delivered another great DVD that we have been enjoying over and over again. If you haven't checked them out by now you are really missing out, kids really do love these series! Colors, Shapes and Counting features the comical adventures of Rollie Roundman, Trollie Triangle, and Rockford Rectangle. These playful characters help preschoolers master basic skills and concepts for the kindergarten classroom through songs, laughter, and games. Children will be so captivated by the bright, action-packed animation and stimulating soundtrack, they'll want to watch and play along over and over again. Even gifted learners will be challenged by the advanced concepts we've included! Preschoolers review the basic colors and also learn maroon and turquoise. They discover polygons, trapezoids, the differences between a square and a rectangle, and more. They enjoy counting objects up to 20 by color, shape, or a combination of both… important preschool sorting skills. 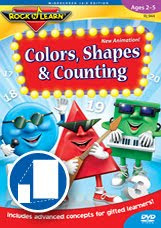 On Colors, Shapes and Counting DVD, the comical characters come to life. Preschoolers enjoy watching so much that many parents report this is their child's favorite. Colors, Shapes and Counting CD and book program offers an early learning experience with books that goes beyond picture stories. Young children can use the audio program independently because picture page markers help them be on the correct page as they follow along with the CD and enjoy the bright, colorful illustrations. *Limited to US residents; 18 years old and above. Giveaway starts November 08, 2011 and ends on November 19 , 2011 at midnight PST. Winner will be emailed and has 48 hours to respond before another winner is selected. I was not paid for this giveaway or post. The opinions on this item are 100% mine and may vary from others. The sponsor is responsible for providing the prize. I would pick the Sight Words Dvd. I think that my son would really enjoy it. I Like Rock N' Learn on Facebook. I Follow Rock 'N Learn on Twitter as Mom2Jacob. I Like our new fan page on Facebook Frugal Family Tree. I Follow FrugalFamTree on Twitter as Mom2Jacob. I would pick the Dance with the Animals dvd. I think my son would really like this! I like FFT on facebook!